It is advised to those who are running their web server with OpenSSL 1.0.1 through 1.0, then it is significantly important that you update to OpenSSL 1.0.1g immediately or as soon as possible. As this afternoon, an extremely critical programming flaw in the OpenSSL has been discovered that apparently exposed the cryptographic keys and private data from some of the most important sites and services on the Internet. The bug was independently discovered by security firm Codenomicon along with a Google Security engineer. The flaw is in the popular OpenSSL cryptographic software library and its weakness allows cyber criminals to steal the information protected, under normal conditions, by the SSL (Secure Sockets Layer) or TLS (Transport Security Layer) encryption used to secure the Internet. OpenSSL is an open-source implementation of the SSL and TLS protocols. The core library implements the basic cryptographic functions that enable SSL and TLS encryption. Mostly every websites use either SSL or TLS, even the Apache web server that powers almost half of the websites over internet utilizes OpenSSL. 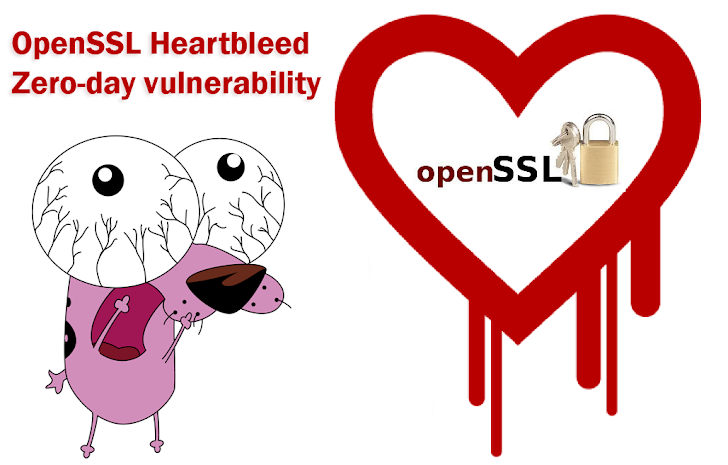 The discoverer of the vulnerability dubbed the bug as ‘Heartbleed bug’, as the exploit rests on a bug in the implementation of OpenSSL’s TLS/DTLS (transport layer security protocols) heartbeat extension (RFC6520). This critical bug with code ID CVE-2014-0160, could allows an attacker to expose up to 64kB of memory from the server or a connected client computer running a vulnerable version of OpenSSL software. Specifically, this means that an attacker can steal keys, passwords and other private information remotely. The vulnerability in the OpenSSL’s transport layer security (TSL) protocols’ heartbeat section has been in the wild since March 2012 and is supposed to be even more dangerous than Apple’s recent SSL bug, which outcropped the possibility for man-in-the-middle (MitM) attacks. As the Heartbleed bug reveals encryption keys that could lead to other compromises, affects past traffic and may affect as much as 66 percent of Internet websites over the internet. 10 out of top 1000 sites are vulnerable to this flaw, including Yahoo Mail, Lastpass and the FBI site. There also is a proof-of-concept exploit for the flaw posted on Github. On this website, you can check if your web server is vulnerable or not. "Bugs in single software or library come and go and are fixed by new versions," the researchers who discovered the vulnerability wrote in a blog post published Monday. "However this bug has left a large amount of private keys and other secrets exposed to the Internet. Considering the long exposure, ease of exploitations and attacks leaving no trace this exposure should be taken seriously." Fixes for the bug have been released by the researchers. So, who are running the OpenSSL 1.0.1f version may update to OpenSSL 1.0.1g. The users running older version of OpenSSL are safe.